Cute, isn’t he? May I introduce to you the Beach Beast, and a playful class example for sense perception and intuition as ways of knowing? Oh yes, we TOK teachers all have our collections of optical illusions and suggestive images to create a gestalt moment. (Aha!) We might even use the word “pareidolia” in class for the brain’s inclination to find pattern in random sense perceptions – with human faces, for example, startlingly apparent on the surface of the moon or the melted cheese sandwich on our plate. But, really, I think you’d have to go far to find an example with the appeal of my local Beach Beast! A friend of mine took this photo and circulated it with delight. Can you see why? For a bit of fun in class, why not show it – or rather, show him — to your students and ask them to give him a name? With a bit of luck, you’ll find they respond to the image and even begin to attribute personality to the Beast. 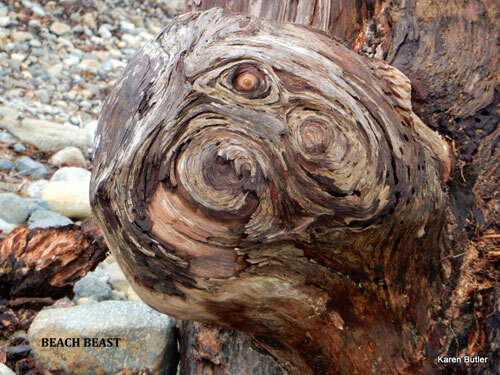 Lest you wonder, I assure you that I do realize that the Beach Beast is nothing but whorls of shape in a log – nothing but random pattern in wood. But, again with a bit of luck, showing his face may have provoked some smiles in your class and cascades of personal anecdotes about seeing faces in the plaster on walls, on the front of cars, in the shapes of clouds. …and from there, it’s a small step to numerous knowledge questions of what we bring, as human observers, to the act of observation. Our ways of knowing of intuition, sense perception, emotion, and imagination are all actively engaged — and what we interpret from all the stimuli around us depends so much on what we carry already, even down to faces being a preferred pattern for our brains. “Carl Sagan, the American cosmologist and author, made the case that pareidolia was a survival tool. In his 1995 book, “The Demon-Haunted World – Science as a Candle in the Dark,” he argued that this ability to recognize faces from a distance or in poor visibility was an important survival technique. While this instinct enables humans to instantly judge whether an oncoming person is a friend or foe, Sagan noted that it could result in some misinterpretation of random images or patterns of light and shade as being faces. But let us not forget our Beach Beast! Even though your class discussion will have left the image behind as you get into the ideas, you might draw a bit more impact from it by showing a second version of the shape in the beach log – but startlingly updated. Yes, he’s been defaced – in the most literal sense of the word. De-faced. Or maybe de-capitated, beheaded. Do some of your students respond with distress? If so, you can close the class with the realization of how easily we can be drawn in to the constructions of our senses and imaginations. 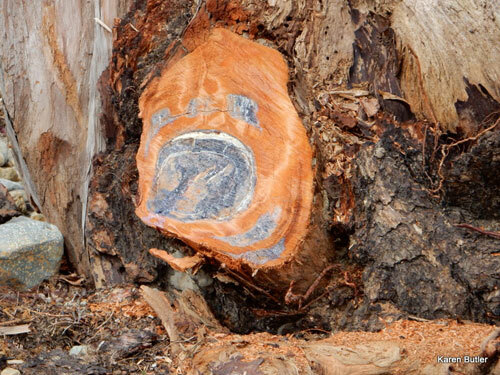 My friend Karen Butler who took the photos was shocked and outraged when she discovered that someone had taken a chainsaw to the log — and had removed the patterns in wood to which she herself had given a name and even (I suspect) some affection. Showing students the second picture might be just a little fiendish if they shriek with dismay. But, even if they never learn to spell “pareidolia”, they might be more likely to remember the point. images of the Beach Beast by Karen Butler, used here with thanks.